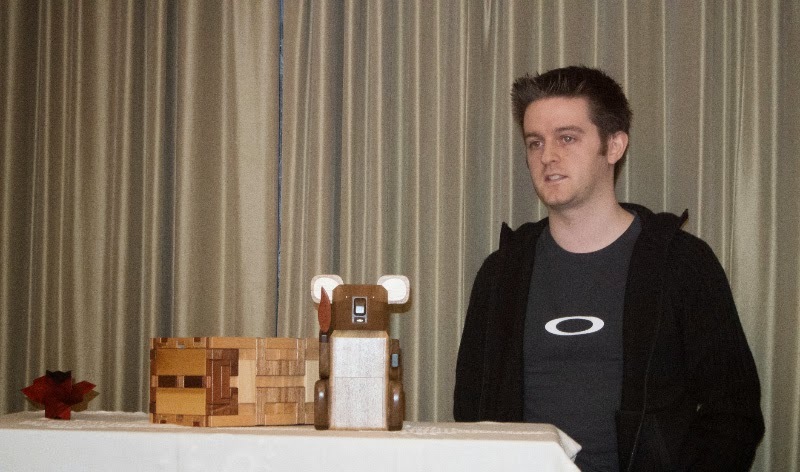 Peter Hajek’s usual End of year Puzzle Party was slightly delayed last year, so instead of happening in 2014, it took place just into 2015 – on the first Saturday of the year, in fact. 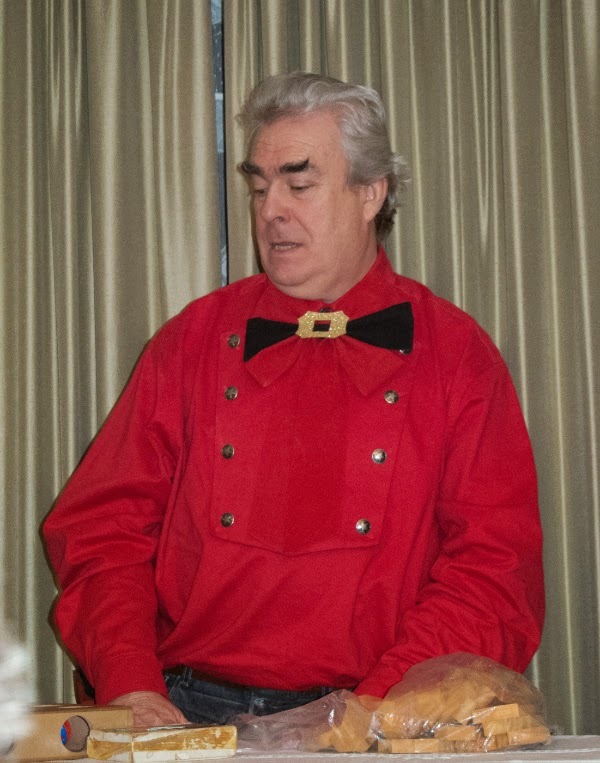 The premise remained the same – puzzlists are invited along to Peter’s for an afternoon of socialising, puzzling, food and short presentations as everyone presents their 3 best-puzzle-finds-of-the-year for 2014. This year the weather wasn’t too bad so I chose to drive down to London and gave Chris a lift down… so we got to chat largely about puzzles for an extra few hours. In spite of having driven down to Peter’s place before, I still managed to take a wrong turn at one point and gave the sat-nav an extra little work-out … it still got us there in the end, although we ended up approaching it from a totally different direction. 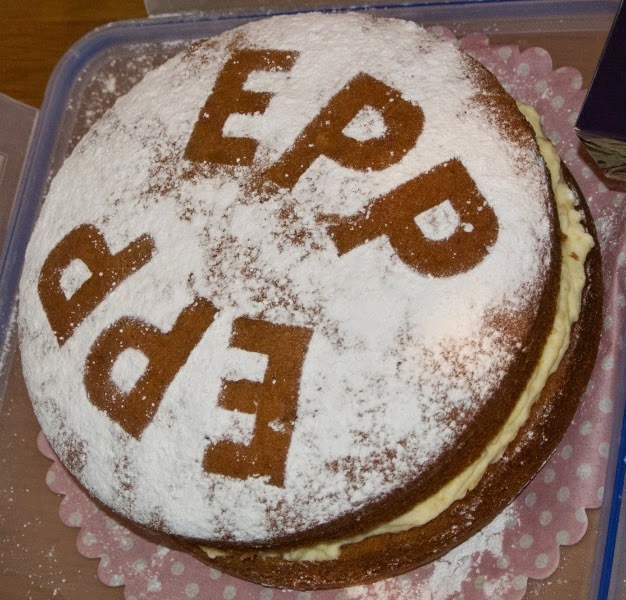 We were greeted at the door by some fellow puzzlers and bumped into Peter a short while later in the kitchen when I was trying to offload the EPP orange cake and some nibbles for the assembled masses. It didn’t take very long for the puzzling ranks to swell and pretty soon there were several knots of puzzlers scattered between the study, kitchen, conservatory and the lounge. As usual there were several crates of puzzles scattered around the conservatory looking for a new home – some of them had a clue to their current owner and several people spent a while trying to hunt down the current owners in order to strike a bargain and re-home a spare puzzle or twelve. Wil Strijbos had a selection of his wares available and I took the opportunity to pick up a prize for Nick Baxter for winning my Christmas competition (a checkerboard burr-in-a-box and a limp key lock, if you’re still interested). 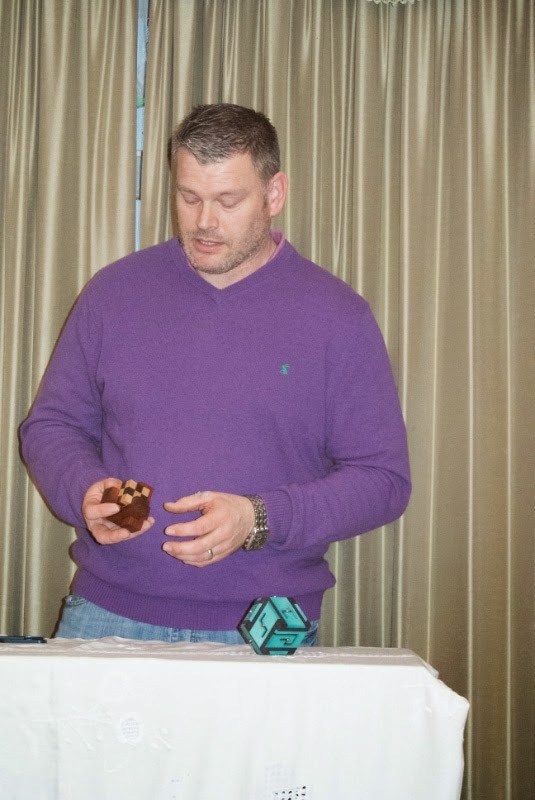 David Singmaster was giving away copies of a 3D two-piece symmetry puzzle he’d recently rediscovered on his bookshelf and Tim Rowett made sure that everyone got a little goodie-bag of delights. As usual there was a brilliant spread of puzzles and listening to everyone else’s talks it was clear that quite often, the choice was due not only to the puzzle itself, but also due to the circumstances of the acquisition or where it came from. 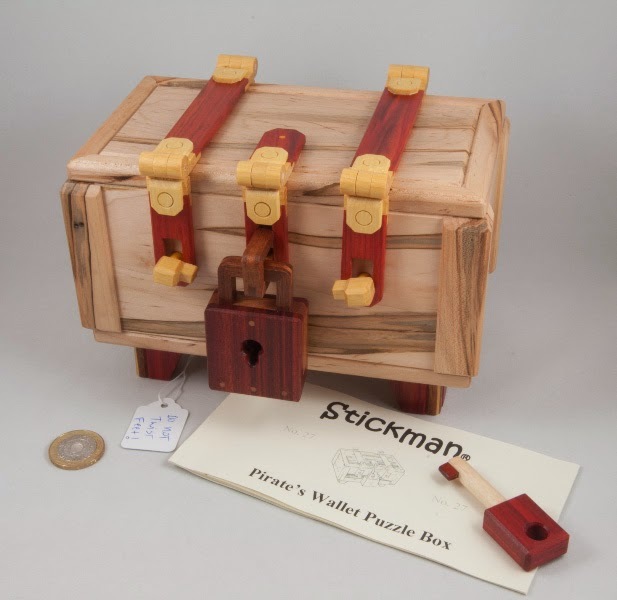 Robert Yarger’s latest creation is a sequential discovery puzzlebox in the shape of a little pirate’s chest with a wooden padlock on the front of it. From start to finish, nothing is what it appears to be and some rather useful tools are either beautifully hidden or rather well-disguised. The multiple layered solve provides a number of discrete stages, each with its own wonderful “A-Ha!” moment. Beautifully made (as always!) with all of the mechanics on display when fully solved. Jointly designed by Jack Krijnen and Goh Pit Khiam, Power Tower is a major step forward in n-ary puzzle design. 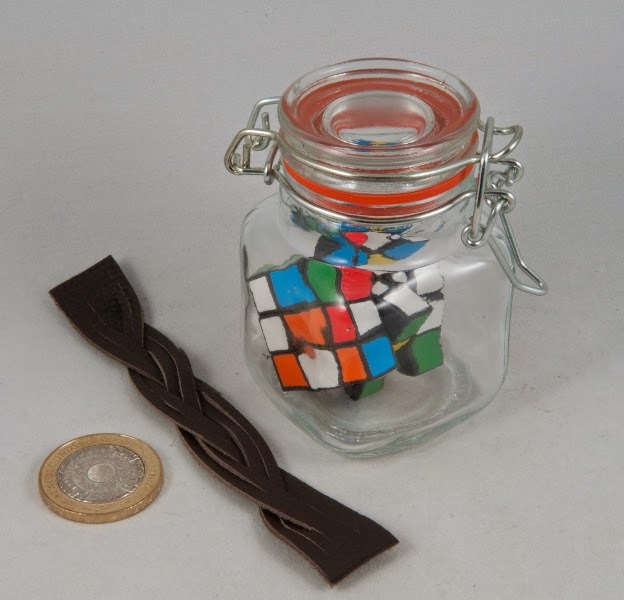 The design allows puzzlists to not only alter the number of sliders (anything from three up to six) but also to mix and match pieces with different bases at the same time – producing some very interesting, often confusing, solve patterns. An absolute delight for any fans of n-ary puzzles. 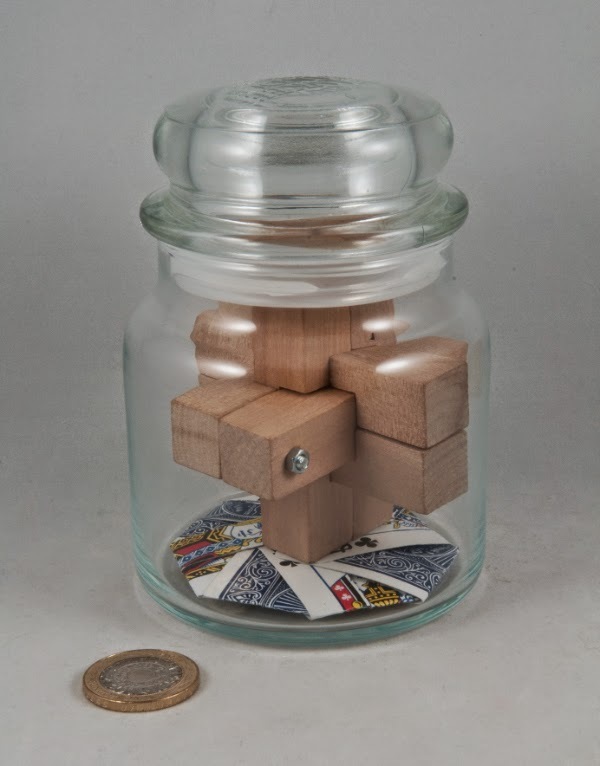 John Moores’ stand-out exchange puzzle from IPP34. 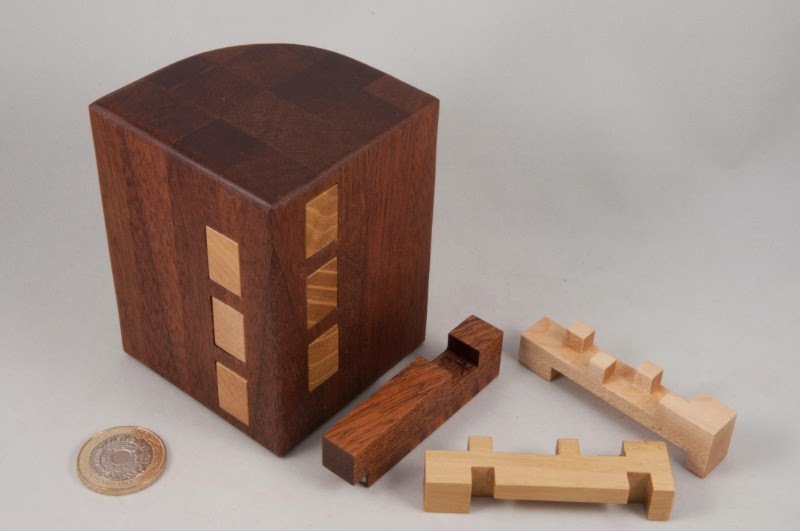 Jointly designed by John, Junichi Yananose and Brian Young, this sequential discovery puzzle is classic Mr Puzzle goodness. Lots to discover along the way and some truly ingenious uses of unusual objects. Broadly divided into two main sections, the solve presents a number of excellent challenges, with puzzlers often realising what they want to do but being totally befuddled at how to achieve it – resulting in a few really special “A-Ha!”s … the last one’s a fitting climax! I really found narrowing my choice down to just three was embarrassingly difficult given all of the wonderful puzzles I managed to add to the collection in 2014. Perhaps Nick Baxter had the right idea of selecting three and then giving a couple of others a shout-out at the end. In all 70 puzzlists from 15 countries contributed to this year’s EPP booklet (available electronically to everyone who takes part… so if you need a reason to contribute next year…) and 16 of us presented our favourite finds in person at Peter’s place. 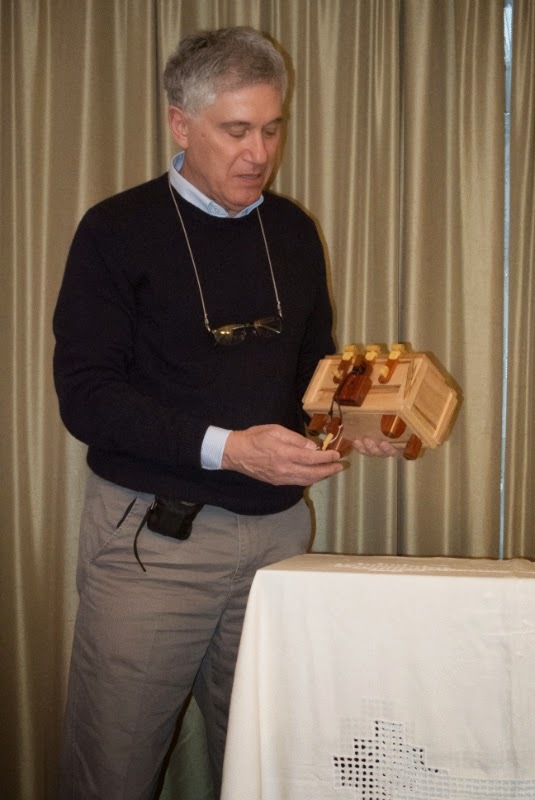 It turned out that 11 people had selected Big Ben making it the single most coveted puzzle of 2014 – I know that would have put a smile on John’s face. 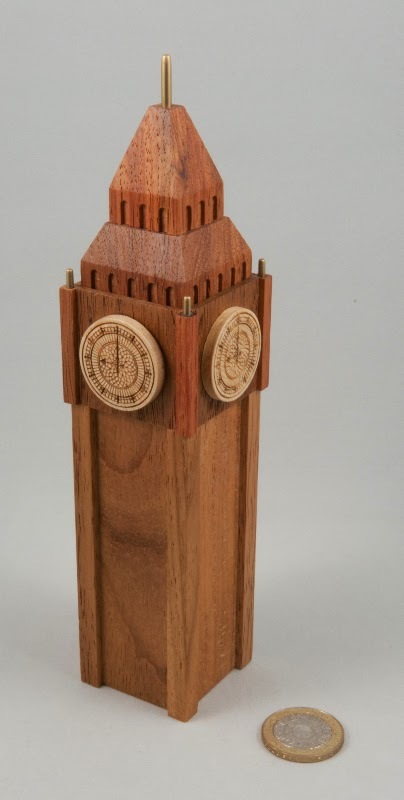 Brian Young was the runaway best designer of the year with a total of 21 nominations thanks largely to Big Ben, Katie Koala and his Gold Coast Parking Meter from 2007. 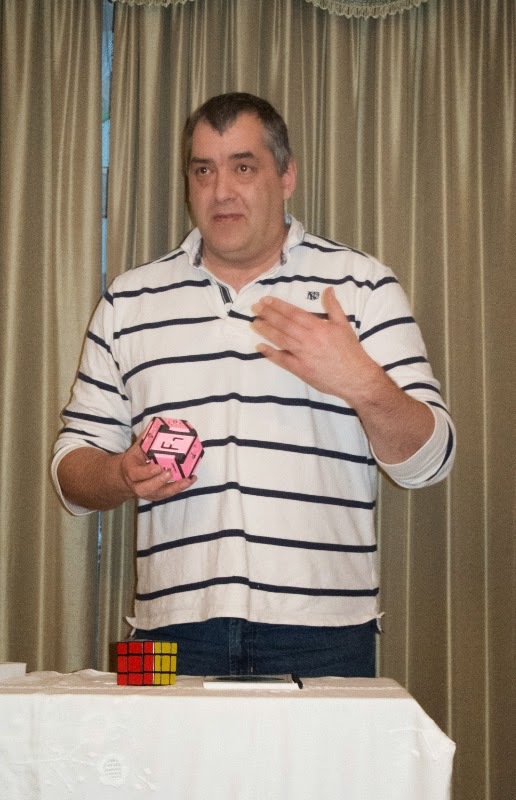 Robert “Stickman” Yarger picked up 16 nominations – particularly impressive when you realise that his puzzles only appear in limited runs once or twice a year. After the presentations there was time for some more relaxed chatting and playing before Peter declared dinner ready and we all trooped into the kitchen to load up on food from the table groaning with food of all sorts. Gee Mahabir treated us to a short set of magic while we were finishing off our dinner – hopefully Katja didn’t mind the cutlery mangling demonstration too much! After dinner there was an informal gathering upstairs in the puzzle room, with various treasures coming out for a play… Chris and I spotted a pile of disassembled puzzles on a shelf and decided they should be reassembled – so I tried one or two of them and largely failed, but Chris and Ali managed to get a few of them restored to their familiar shapes… much to Peter’s delight since he reckoned some of them had been disassembled since he’d got them many many years previous. Another brilliant day with fellow puzzlists from round and about…Thanks Peter! 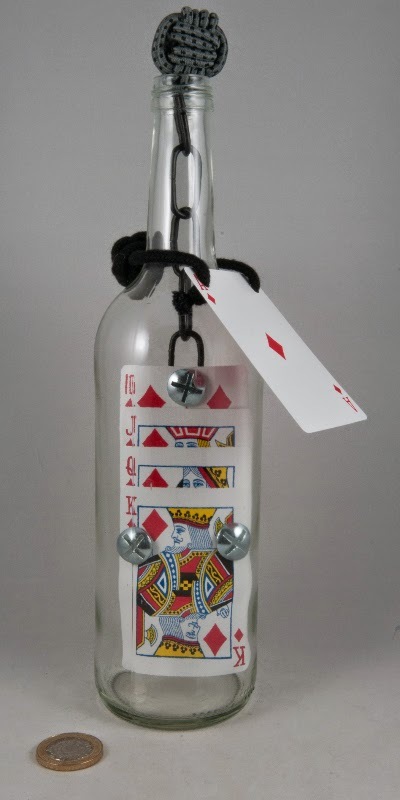 Soon the awful people of internet-land began goading him into further impossibleness so he placed several twisty puzzles inside bottles with throats too narrow to allow them out (sensible use of a twisty puzzle in my books!). Now back when he started playing around with impossibility, he offered to make me an impossible bottle as a gift … and when I ran into him at Peter’s place just after New Year he had brought along an entire crate of impossibleness, some to give away and some for sale – several to chat about. 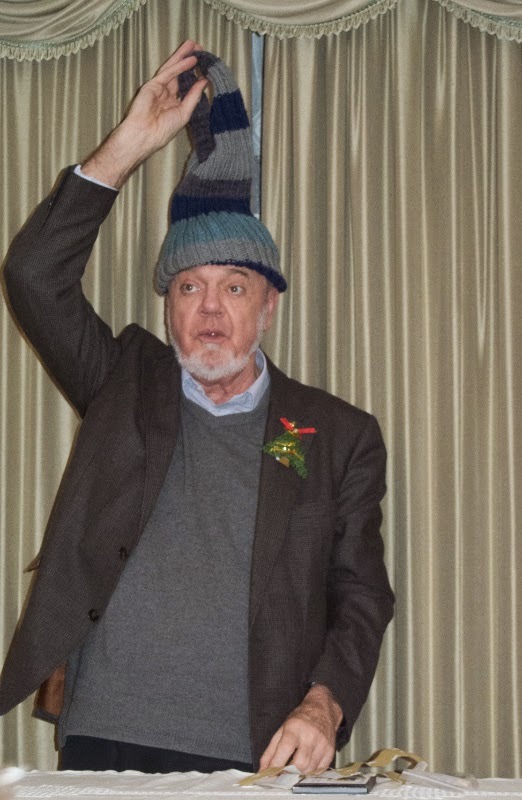 …and that’s how I ended up with a haul of Oli’s impossibility – including a Royal Flush, most of it bolted and suspended from a chain inside a bottle, secured by a Monkey’s Fist knot or two – Just Brilliant! 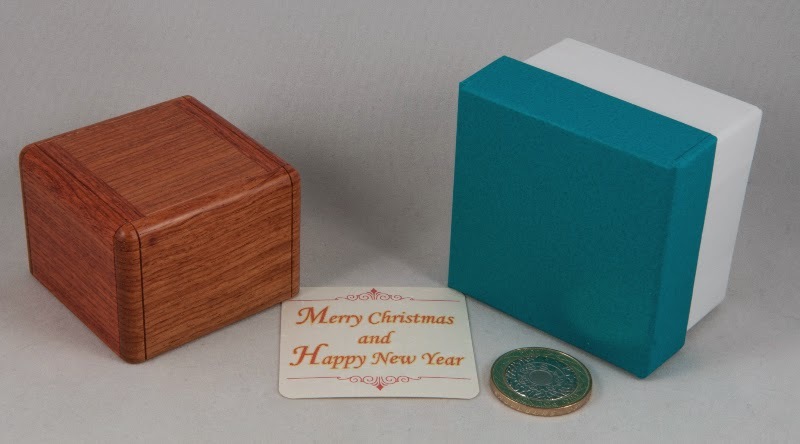 Unfortunately this year my Karakuri Christmas presents took a bit of an extended detour via the Her Majesty’s Revenue and Customs so they didn’t quite make it in time for Christmas… but that doesn’t mean I wasn’t puzzling away on Christmas day! I’ve written about how the whole Karakuri Club works in the past, so feel free to have a look back at the previous write-ups over here or here if you’re still wondering how it all works. From memory their prices have remained pretty much the same for the past few years and I reckon they’re still excellent value for money – as long as you don’t mind the lucky dip element: you won’t know what the puzzles are until you open the package… you can select the craftsmen you want, but they get to decide what they’re going to make for Christmas. 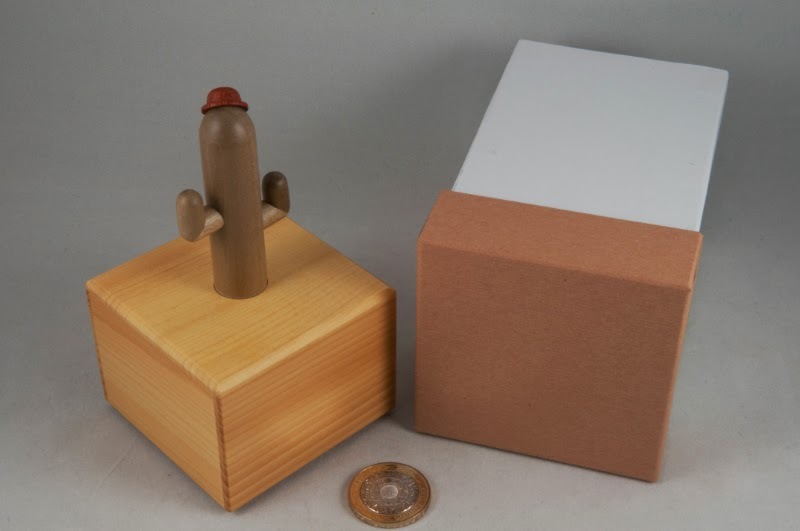 Kasho’s puzzle box was a rather quirky-looking cactus plant with a hat, called Tequila … happily it’s not a terribly difficult puzzle so you shouldn’t find yourself driven to the bottle for inspiration. 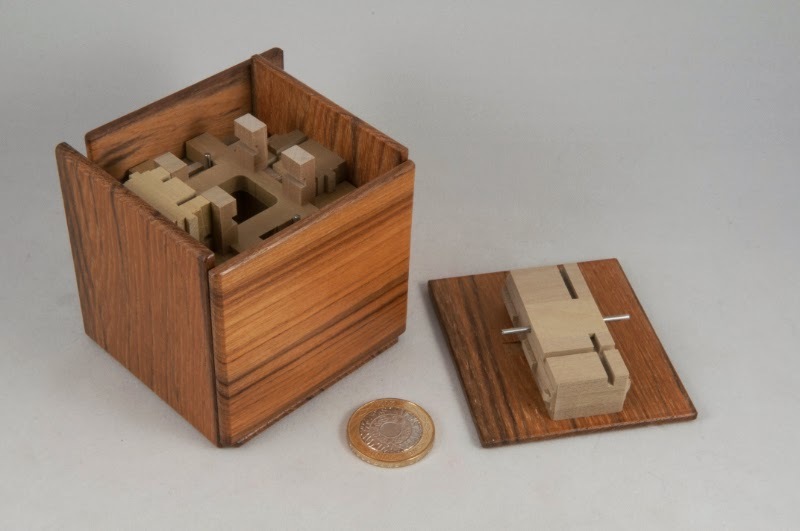 It only takes a couple of moves to open it and you’re probably going to go straight for the locking mechanism without much experimentation – definitely not much of a challenge, but a funky looking puzzle! 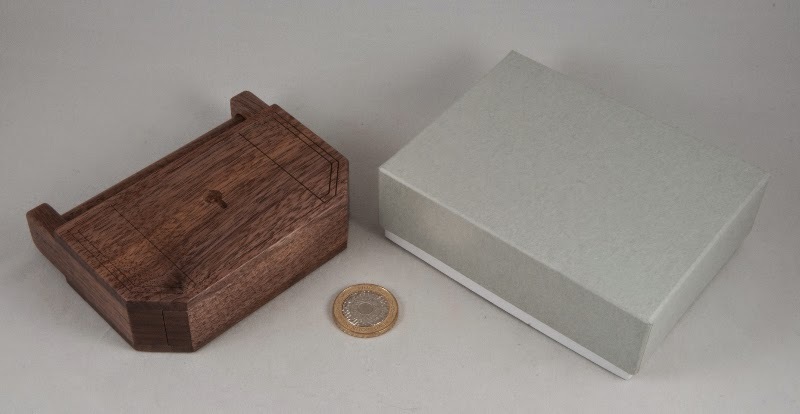 Tatsuo Miyamoto brought us a puzzle box in the shape of an antique wooden Lock – once again the mechanism isn’t particularly complicated, but the workmanship does mean that you won’t spot it straight away – once you do though, it’s pretty much game over with a little drawer popping out immediately. Kamei produced an interesting variation on his parcel cube series from the 1990’s with New Parcel Cube. It looks a bit like the old parcel cubes in that it’s a cube with a set of bands around the sides. 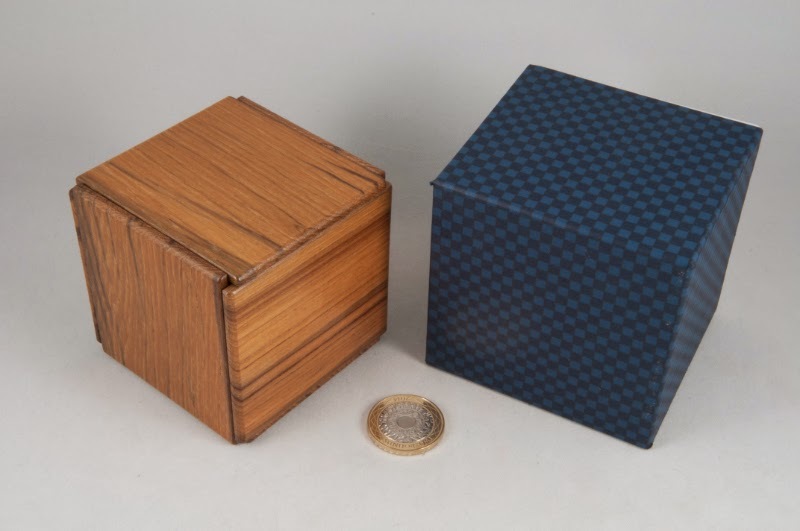 Whereas the originals had bands that stood proud of the cube, the new version has darker bands that are flush with the surface of the cube … and a little thinking might give you some ideas as to how to get the mechanism started. I found myself taking a little while to work out the right grip, but then I’m a bit slow sometimes … and you might be interested to know that there are two compartments to find … one thing that really struck me about this puzzle is the superb fit – some of the pieces will go together in various orientations, and if you deliberately change their orientation as I did, the final fit is still absolutely perfect … gosh! Shiro Tajima produced a rather cute looking Sheep. It's clearly a box, and something is obviously going to happen with the belly and the back of this little beastie, but it has a tricky little mechanism to keep things locked up. 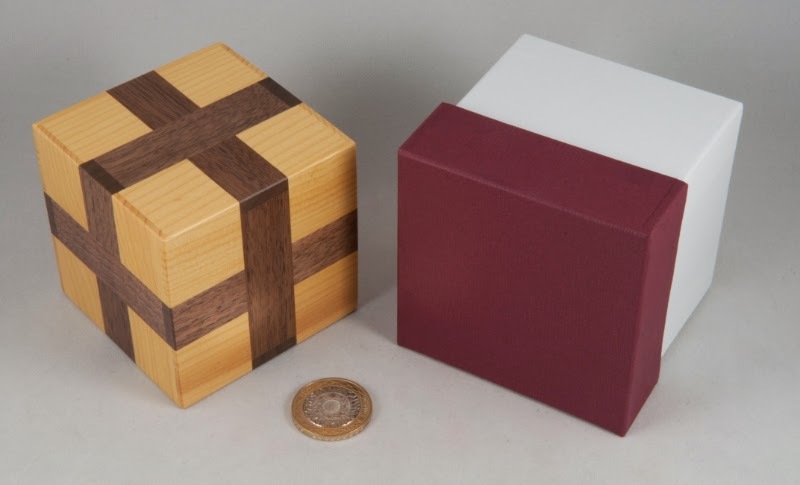 Once you find the first move, you'll be shown a little of what's going on inside, but until you work out what you can see in there and how to use it, this little box is going to remain firmly locked. It's a bit fiddly and won't reward clumsiness, but a deft touch will have it open in seconds. 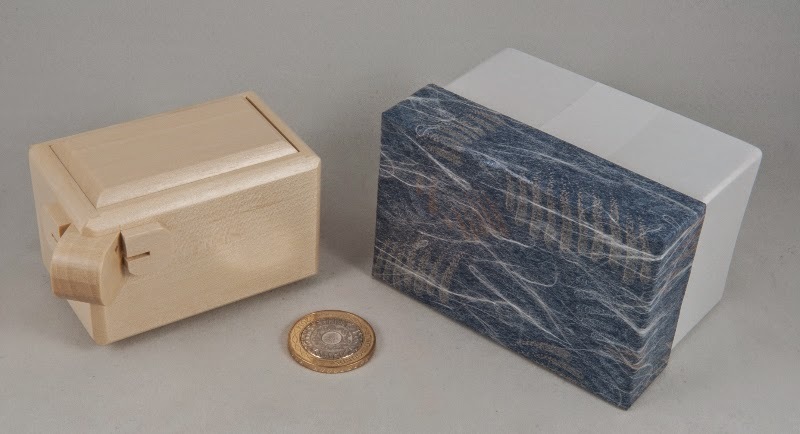 Hideaki Kawashima continued his tradition from last year and produced another Ring Box (no. 3). The first one wash reasonably straight forward and the goal was really to open the box. The second added a great trick to stop you from removing the ring, allowing you to get into the box reasonably easily. This year took the previous puzzle and made it a lot harder … and this one took me by far the longest to solve … I had it out next to where I usually sit to watch the telly and I’d pick it up and try various things each evening – generally to no avail. 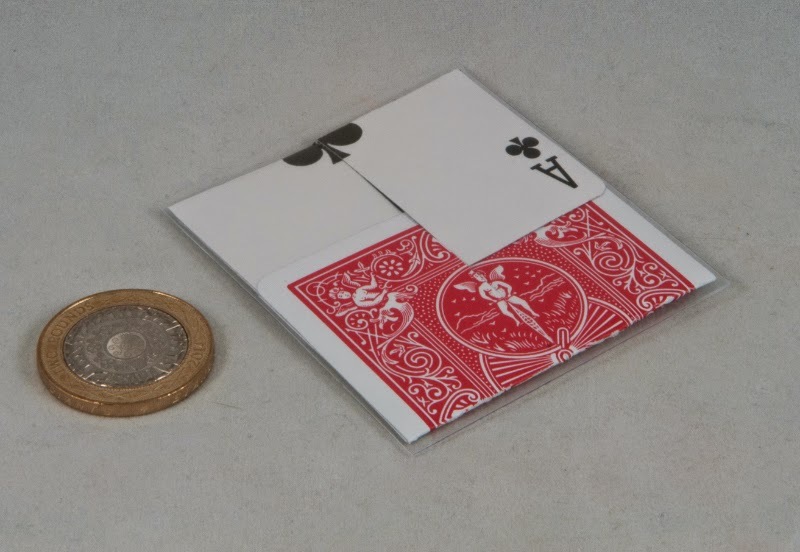 Now, I wouldn’t be spoiling anything to tell you that the box comes with a little card telling you that the goal is to remove the ring from the box … opening the box is pretty straight-forward – there isn’t even a trick to it – the lid is just very well made and virtually invisible to a casual inspection. Once you’ve opened it you’re greeted with a silver ring nestling in a standard ring-box insert – except this one’s thoroughly locked in place! Fiddle around with the box and there are clearly things going on inside there – but it’s hard to tell if it’s a ball bearing or a metal bar in there – one thing you can tell is that working out how to release the ring is non-trivial … so I spent ages fiddling with it over the course of a couple of weeks. One evening I had a call from James asking if I’d solved it yet and then he told me that he’d buckled and had a look at the solution which had just arrived … but that didn’t seem to make sense, so he phoned a friend and between them they managed to work out it, he refused to give me any hints and told me that I’d like it, so I picked it up again and set about things a bit differently, and this time I found the solution, and James was spot-on – I do love it! It’s a brilliant progression from the first two, and I’m not ashamed to say I was totally suckered by it! So how would I rate this year’s haul? For me there are a couple of fairly simple puzzles that won’t hold up a dyed-in-the-wool puzzler for very long… a classic re-make with a twist, a really unusual looking tricky little box, a brilliant variation on a theme and a terrifically complex puzzle that’s fun to work through… all told a great haul!